Welcome to the Parent Teacher Association page of the Coppice Primary School website. We hope that this will give you an idea of what the Coppice PTA is and does and will encourage you to think about putting yourself forward as a PTA member or helper. Coppice PTA is a registered charity (no. 1085382) and runs mainly as a fund-raising organisation, although does support the school in a number of practical ways also. It is made up of a group of parents and teachers who work together to organise and run a number of events throughout the year. The choice of events depends on the ideas and skills of the current PTA committee members. See our Diary page for dates of specific events and the Newsletters page for our recent PTA Newsletters. To receive updates of what will be happening at events and how you can support your child's school please 'like' us on Facebook. We also support the school by providing refreshments at various events, such as the school show, sports day and new parent events. New ideas are always welcome from both PTA and non-PTA members. All the events are designed to bring a community feel to Coppice and for children and/ or parents to have an enjoyable time while raising money to improve the facilities for the children. 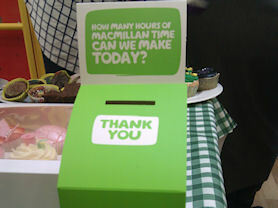 Thank you to all who supported the coffee morning in aid of MacMillan. Recycling ink cartridges (four collection boxes at the top of the main stairs, one for each house. The children receive house points too!). Bag2School clothing collections. Please bring all donations on the day (see our diary for collection dates). We cannot accept donations in advance). We receive 50p per kilogram donated from Bag2School. Scholastic and Yellow Moon commission (when you make purchases from www.yellowmoon.org.uk (external link) please add source code SCO1526 and we will receive 5-20% of the purchase price at no extra cost to you). Name Labels – An order is placed in the summer term for name labels. Each order will result in a £2 commission for the PTA. The sale of end of year mementos such as KS2 tea towels and KS1 bags. £100 has gone to each class to choose special items beyond normal curriculum budgets. £2,000 of resources to improve the outside area near the Reception classes. 8 chess boards for the lunchtime chess club (£40). A Trophy for the Annual Coppice House Competition (£70). Swimming hats for the Coppice School swimming team ahead of the Sutton Schools Gala in February (£100). A new piano for Coppice hall (£3,100). Decisions about how money is spent are made by the PTA committee in collaboration with the teaching staff along with suggestions from pupils via school council. Coppice school is a great example of the 'big society' where parents and staff work together to raise money in a voluntary capacity to support the learning and experiences of the children in the school. The main committee is elected every October and usually meets around once a half term in the evening to plan events and agree how money raised should be spent. Subcommittees meet in between to work on specific larger events. All parents and staff are very welcome at all meetings, but only the elected committee are allowed to vote. Come to events such as the discos and spend an hour serving drinks to the children, tea for new parents or a half hour stint on your class stall at the Christmas or summer fayre. Use your business links to acquire prizes for raffles at some of the events held. Use your experience to suggest and/or run an event in aid of the PTA. 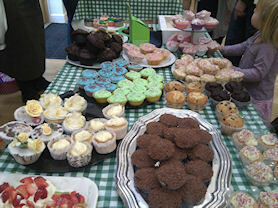 Many of our large events, such as the school fairs, cannot run without the support of parents. Whatever support you are able to give would be very much appreciated. Please contact the secretary to find out more.